I was reading up on all types of diets and this truly needs to circulate throughout the world! This is truly cheating. I’m not sure if it could be cheating on a diet or with one. But, please, read it and give thanks to the School of Physics, University of Sydney, Australia! And I thought Canada had the hands up on the whole beer thing. 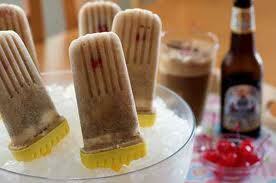 Hmmm – maybe beer popsicles? ~ by 1fatgirlshrinking - Diane Kirby on February 25, 2012. I’ve been working on a blog post for today, but I’m also working the one I lost yesterday, which I intend to post Monday. Then I ran across this. MINDBLOWING. This SOUNDS like it could work! And if not, it’s certainly an amusing idea. Well, isn’t science how we get sold these ideas? Well, at least we’ll drink more ice water!